Get Rid Of Those Pesticides In Your Plate! We cannot imagine anything that is devoid of chemicals anymore. While some chemicals are forced upon us due to adulteration, a certain amount of chemical usage in food is inevitable in our everyday life. One among them is the abundant usage of pesticides used in farming. Most of the vegetables and fruits we buy from the local market have pesticides beyond permissible limits. You may then think that opting for organic foods might reduces the pesticide load in your food. But, with the prices of vegetables and fruits skyrocketing, it is not practical to buy organic foods on a regular basis. So, how do you get rid of these unwanted pesticide residues in food? Are there easy ways to get them out of your plate? Yes, there are. The National Institute of Nutrition has released few guidelines that are simple and quick to do it yourselves and these help get rid of pesticides to a large extent. Read through. 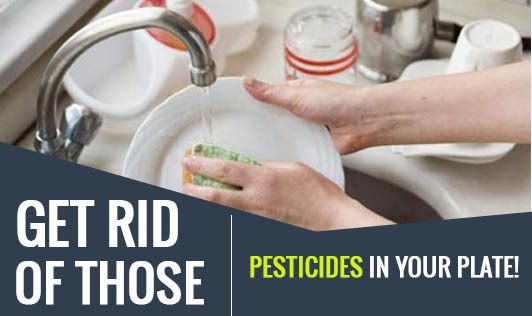 Washing: About 70 to 80% of pesticide residue is removed with cold water washing. Green leafy vegetables and other vegetables and fruits like guava, grapes, mangoes, tomatoes, okra, brinjal, apples, plums, and mangoes need two to three washings. Blanching: A short hot water treatment to fruits and vegetables after thorough washing further removes pesticides. Peeling: Peeling the skin of fruits and vegetables also reduces the systemic and contact pesticide residues. Soaking fruits and vegetables in water with tamarind extract, or vinegar or turmeric for a couple of minutes also removes pesticides. It has to be again washed with plain water. Most of the pesticides are fat-soluble, so it is important to trim the layer of fat from the meat. Cook meat and chicken thoroughly. Boiling milk at a high temperature will destroy the persistent pesticide residues in the milk. Though most of the hazardous pesticides like endosulfan are banned, there are many more pesticides that are abundantly used beyond permissible limits to protect crops and promote better growth. Prolonged ingestion of pesticides leads to gene mutations, cancer, nervous disorders, and infertility. Let's try our best to avoid pesticides by encouraging organic farming and try to grow our own vegetables. It can become a new hobby. Try it!